Shen Chi is a very minor Robin character. He’s mostly notable for featuring in the first issue of the cool 1991 Dixon/Lyle Robin miniseries, and having good fighting skills for a teenager. I’m fond of having such very minor characters resurface in RPG campaigns, even if it’s in bit roles or in a “where are they now ?” snapshot. Obscure quasi-supporting character such as Shen Chi can also be a good base to develop for some NPCs in the game, while giving them the “as seen in old comics !” patina. Real Name: Shen Chi (but this may be his given name rather than his full name). Known Relatives: Rahul Lama (Grandfather, deceased). Group Affiliation: Student of the Rahul Lama. Height: 5’ 8” Weight: 135 lbs Age: Should now be 17 or so. Shen Chi is a competent martial arts student. But he isn’t focused, and thus doesn’t progress much. On the other fist, he does have good real-world brawling experience. While he could out-kung fu Robin (Tim Drake) when they first trained together, he soon became outmatched by Boy Wonder. Still, an unprepared opponent could be surprised by the effectiveness of his strikes. 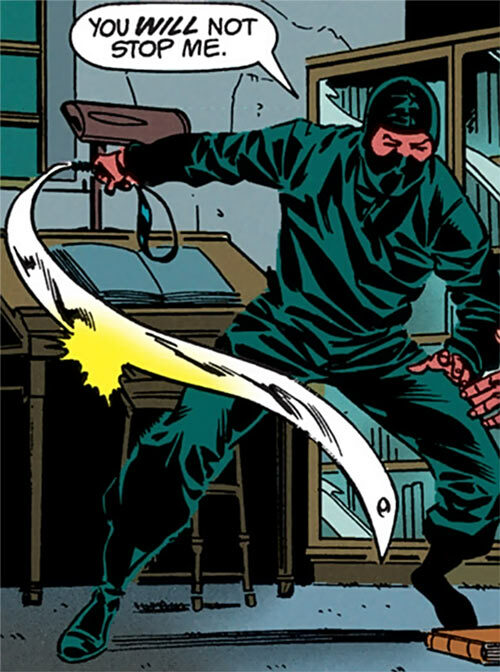 Shen Chi was well-trained at hitting pressure points (in DC Heroes RPG terms, EV sub from Martial Artist). The Rahul Lama’s healing arts are a vast, ancient body of acupressure techniques. However, Shen only ever learned the most basic and least boring aspects of these. Shen is also trained with some traditional missile weapons – sling, bow, crossbow, spear. These were used by his ancestors to hunt. Shen Chi is the grandson and the only long-term student of the Rahul Lama. The Lama a great martial and healing arts teacher who lives in Paris. However, discovering the existence of the Lama and locating him isn’t easy. And the price tag for his instruction is prohibitive. In 1991, young Robin (Tim Drake) came to study with the Rahul Lama. Shen Chi helped with Drake’s training and orientation. It was when Shen took Tim on a night out that Robin first met the Ghost Dragons and Lynx. 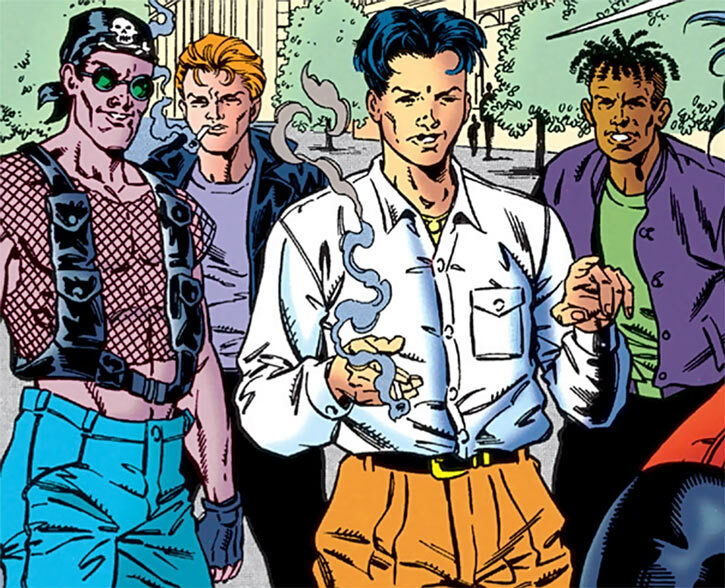 In 1996, Shen Chi randomly spotted Tim Drake in Paris. Never having liked him much, he tried to challenge the American to a fight right in the middle of the street. Tim easily blocked his kick, swept him and shoved him tumbling into his friends, then left. Shen Chi and friends in 1996. After the death of the Lama, Shen Chi tried to study under another Paris-based master, the Iron Hand. However, during the first lesson he acted loudmouthed and arrogant. As a result, Iron Hand promptly knocked him out using his signature Whispering Hand technique. Shen Chi was expelled, and Robin, who was watching, took his slot in the course. A short time later, Shen Chi armed himself with a flexible sword and a ninja costume. Then he attempted to steal the Iron Hand’s tomes. However, Robin spotted him and knocked him out. Drake told Iron Hand that Shen Chi was just greedy and not a real threat. Thanks to this advocacy, Shen Chi was simply thrown out without apparent complications. 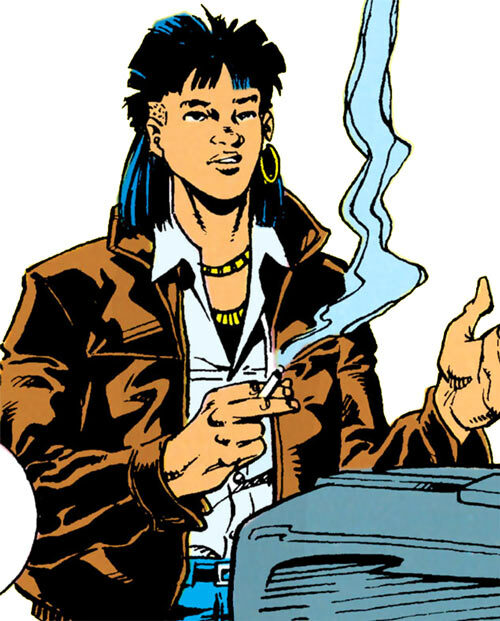 Shen Chi aims for a cool young tough look, and is a chain smoker. Shen Chi is completely Westernized. He doesn’t care for the depths of the martial arts of the Lama, and certainly not about the healing arts. What he wants is to study enough to open a chain of McDojos when the Lama dies, then rake in the dough and live the easy life. And maybe appear in a movie or two. He dislikes the Spartan squalor of the Lama’s quarters, and prefers going out to enjoy the Parisian night life. Being a teenager he’s a bit girl-crazy, and is always looking for some action. This put him at odds with the nerdy, serious Tim Drake. After the Lama died, Shen Chi found himself the last master of his fighting arts. Tim Drake only had time to be taught the healing arts. Shen grew arrogant, seeing himself as an important man and demanding to be treated with respect. He presumably did not deal well with his defeats at the hands of Robin. Shen regards Americans like many Americans imagine Frenchmen do : with a low-key hostility and envy. He’s something of a bully, though he certainly can back his threats. Area Knowledge (Paris), Language (French, Tibetan). Rahul Lama (Low, now deceased). When he broke into the library of Iron Hand, Shen sported a ninja-style costume whose belt was a long blade of tempered steel similar to an urumi. This is a wafer-thin, broad ribbon with razor-sharp edges [BODY 02, EV 04 (06 w/Martial artist), Bonus : Cannot be Blocked short of a full-sized shield]. This weapon is usually seen in Indian styles. Shen Chi almost always subs Martial Artist for EV, hitting pressure points. – Strength-based unarmed Damage 2, Quirk (must be able to hit known pressure points on his opponent’s body). – Affliction 5 (Dazed, Prone – Limited Degree), resisted by Fortitude, Quirk (as above). – Regeneration 1 (Affect Others, Concentration). All-Out Attack, Chokehold, Close attack 1, Defensive Roll 1, Improved trip, Ranged attack 1. Benefit 1 (Has access to the Rahul Lama’s archives), Equipment 2, Languages 2 (French, Tibetan). Athletics 2 (+3), Insight 1 (+1), Perception 2 (+2), Ranged combat (Low-tech missiles) 3 (+6), Treatment 4 (+4) (Limited 2 (Limited to Revive and Stabilise), Vehicles 2 (+4) (Limited 1 to land vehicles). Greed isn’t good Shen craves money and, to a lesser extend, admiration. Young peacock Shen is young and immature. Trade-off areas. Attack/Effect PL 5, Dodge/Toughness PL 4, Parry/Toughness PL 4, Fort/Will PL 3. Points total 52. Abilities 22, Defences 10, Skills 5, Powers 4, Devices 0, Advantages 11. Equiv. PL 4. The urumi (and the ninja costume) were mission-specific. In normal conditions he’s not using his Equipment pool. 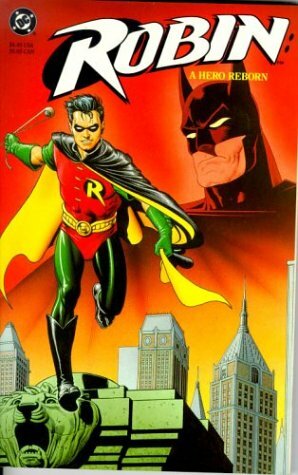 Source of Character: Robin series (DC universe).